Going for a Ride is out! 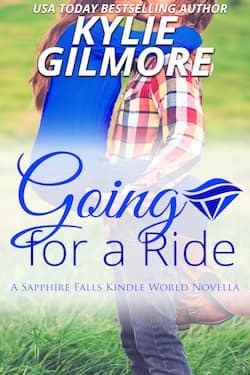 My novella, GOING FOR A RIDE, is out in Erin Nicholas' Sapphire Falls Kindle World. Get your copy at Amazon. Kindle Worlds are collections of novellas set in another author’s world. Since Amazon invented Kindle Worlds, the stories are exclusive to US Amazon/Kindle, but Nook/Kobo/iBooks readers can still read it on the free Kindle app. International readers can read it by opening a US Amazon account. Hope that workaround helps! Star wide receiver Nick Hansen is used to a stadium full of adoring fans after the glory of four winning college football seasons, but that’s all in the past when he flubs the tryouts that would make him an NFL draft pick. Now he’s spending the summer working for his uncle’s traveling carnival company and trying to figure out who he is without football. Free-spirited Kelsey Brown returns to her hometown of Sapphire Falls, Nebraska, for the annual festival and a much-needed break to figure out her next career move—follow her corporate advertising job in its relocation or feed her artistic soul with the photography that she loves. But when she discovers her long-time football hero crush is working the festival, she quickly decides she’s going for a ride. With him. Sizzling summer nights in Sapphire Falls soon lead to a future neither of them could have imagined. But can two very different people follow their dreams together?